Born in Brunswick, Ga. in 1959, Jackie Roberts moved with his family to Atlanta, Ga. when he was 11 years old. Jackie graduated in 1977 from Southwest Atlanta High School where he was a member of the Junior ROTC. In 1979, Jackie married and had a daughter. Jackie and his wife divorced in 1987. While going to High School, Jackie was employed by IHOP where he worked as a cook for 4 years. In 1980, Jackie began to work for Print Package, Inc. where he was a fork lift operator and it was during this time that he became disabled. For the past 30 years, Jackie has lived in various residences including personal care and group homes, shelters and the streets as well as staying with relatives at various points in time. Unfortunately, Jackie has had trouble with his mental health and managing his income which has led to unstable housing particularly over the past decade. 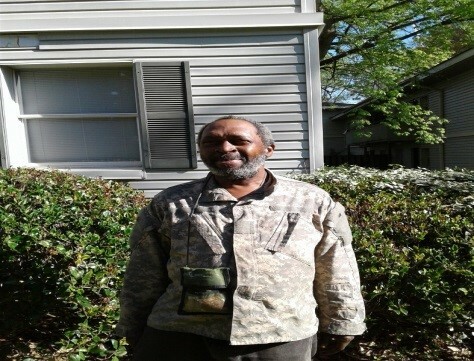 Both his disability and his poor health led to his homelessness particularly over the past five years where he was spending most of his time existing in front of Grady Memorial Hospital. It was his frequent need to visit the Emergency Room that led to his referral to Homes of Light. Jackie is grateful that HOL has provided him with a stable living environment, that he has been able to consistently address health issues, and been connected to a Payee to get his finances under control. With his stability in permanent housing, he has also been able to spend time with his family particularly his 2-year-old twin granddaughters which gives him great pleasure.